This very unusual and richly elaborated quadrant is essentially a planisphere, but very similar to the 'new' quadrant devised in the 13th century by Profatius Judaeus. 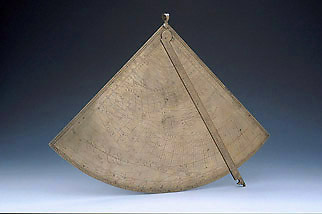 On one side is a projection of the heavens, in fact a folded astrolabe, indicating the equator, the tropics, the ecliptic and 37 stars. On the back of the quadrant is a stereographic projection of the northern hemisphere. The instrument was probably not used for observation, but as a model of the heavens and as a calculating device for the same tasks as an astrolabe.